Alf Cooke company had been first founded by Alf Cooke in 1866 in Leeds as a printing company. 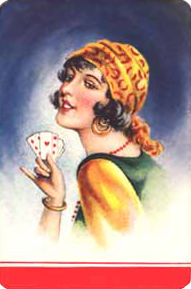 The company had first produced their playing cards as “British Playing Cards” during the 1920s and was known for their unusual designs for the court cards and their variety of packs. From the period of 1920 to 1970, Alf Cooke was a very important company for playing cards manufacture in the UK. The name of the company was later changed in 1925 as the Universal Playing Card Company Ltd.
With the Universal Playing Card Co as a subsidiary, the Alf Cook Limited started appearing on the court cards manufactured by them, especially on the aces in the 1950s. It was only later in 1970s that the company was taken over by the Waddington’s. The company was known for their large range of playing card decks. They were also known to be producers of several innovative tarot cards, fortune telling cards, games and cards for adults as well as children. The company produced a wide range of cards for Romania, Iceland and Denmark in the 1930s. The Five O One playing cards manufactured by them under the Universal Playing Card Company Limited in 1936 were for Denmark. These cards were based on the Dondorf Rhineland card patterns and were known for their designs. Every suit in the deck was different and the indices of Kn, D and K were used on the courts in Scandinavian style. Every suit has a different colored glow on the background of the cards in the court figures. Their Icelandic Chess pack of cards was also quite innovative. The cards were manufactured by Universal Playing Cards Company but were designed by Tryggi Magnusson in 1942. These cards have the standard indices but have a sloping dividing bar in the cards which were made in different colors. Several of their other varieties include the Sloanesque playing cards, the fortune telling cards Romany, the Romanian decks of playing cards, the State Express cigarettes cards, the Universe No 100 playing cards, the Navy cut cards, Danbrit cards and the Whitbread’s Pale Ale cards. Due to their variety of decks and their innovative designs, the Alf Cooke cards have been exported to several European countries. Their cards, patterns and designs have also been copied and adapted by several other playing cards manufacturing companies throughout the world.